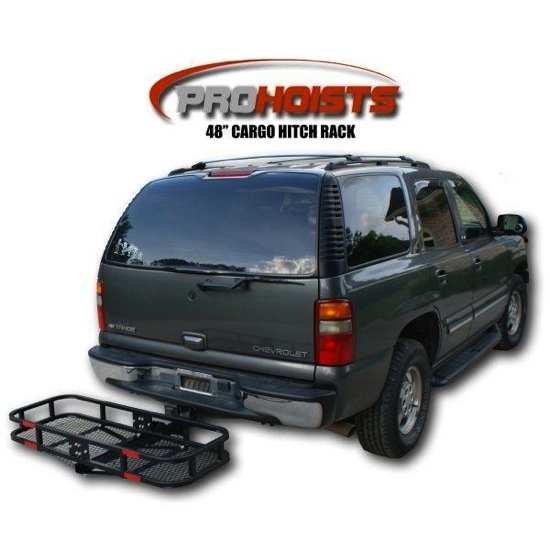 The Prohoist 48 Inch Cargo Carrier is the perfect travel companion. It is versatile and convenient for many applications including Road Trips, Tailgating (for Sports Fans) or Trips to the beach. If you can fit it you can tote it. From coolers to lawn mowers this carrier is second to none. This carrier is designed for Class III - 2 Inch hitches (Not Included). The entire carrier has the option of tilting upward and locking in the upright position for transporting without a load. This allows more parking room within your garage or elsewhere. The carrier will also detach if not needed or for storage. Anti-Wobble Device fuses the carrier and the trailer hitch receiver together to reduce movement and prevent trailer hitch receiver damage. * Max Capacity: 500 lbs.